We've all tried to do it - drill a hole down the middle of a bolt or rod. Making steam engines, nozzles, RepRap parts, air gun barrels, whatever it is physics conspires against us, and the hole never goes straight. 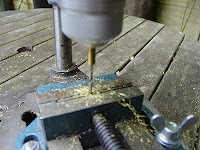 But it can be done in a hobbyist drill press - the type that holds a power drill - by making physics work for us. First off, the drill press itself must be reasonably solid. So, no pressed metal, no tubing, no plastic clamps. Get a good, solid cast-iron cheap one with a solid post. They churn them out in China and I paid NZ$30 for mine. You will need a drill vise that fits the drill press. Pick one with a small notch in the middle of the jaws. Next, the power drill. You'll need one with variable speed. Make sure hammer drill options are turned OFF or you will smash things to bits. Being in "forward" helps too. Finally, make sure your drill bit is sharp. Sharpening by hand is really quite easy and a badly hand-sharpened bit is more use than an old, dull bit anyway. Put the drill bit hand-tight in the chuck the wrong way round. Lower the press so that the bit can be clamped in the vise. Tighten the vise and bolt it firmly to the drill press base. Tighten the clamp that holds the press mechanism to the post. Now loosen the chuck and slowly raise the drill. Do not let it fly up or it'll whack itself out of alignment. 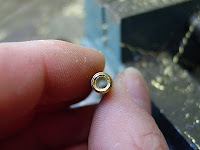 Place the bit of rod or bolt that you want to drill into in the drill chuck. Tighten it up and make sure it and the bit are still central. 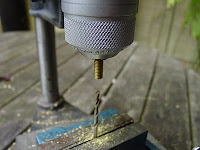 Using high speed and very little pressure, lower the drill onto the bit. This will cause a little vibration initially, but soon small turnings will fall and the drill bit will automatically "hunt the centre." Slow the drill right down and gradually increase the pressure. You want to see gleaming, long streams of swarf coming out, not many little fragments. If swarf stops coming out or you see smoke, stop and clear the bit with something pointy. Fingers are a poor choice as the bit will likely be damn hot and the swarf is really sharp to boot. 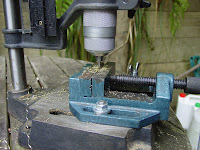 For deep through holes, stop half way (mark the bit with a pen), reverse the part in the chuck, and start again. There will be a little jamming as the two holes meet - go through it and the result is a beautifully central hole! I mostly do this with brass, but if you do it with steel you'll need coolant/lubricant. It comes in cans at the DIY store. So there you go. Neat, central holes. Nice work! It's always when we turn an idea on it's end, can we find a workable solution. BTW, way to go on making Hackaday! Awesome. I'll be using this trick over the weekend. I need to make some cable housing stops for my bike. Brilliant piece of know-how, Vik! But I still don't understand why with this way we can get centered holes... can you please explain? TO AVOID THE INITIAL VIBRATION AND THE RISK OF BREAKING THE DRILL BIT...WOULD NT BE MUCH MORE SECURE TO CLAMP A CHUCK IN THE VISE...SO THE DRILL BIT IS MUCH MORE STABLE WITH THE THREE JAWS...AND IT IS PERFECTLY SOLID...! !IF YOU THINK OTHERWISE PLEASE ANSWER..!!! I used a spare chuck in the vice to hold the drill I used to do this before I had my lathe. i was hoping that there was another way... because i have to drill a hole in a clamp for shop class... awesome idea though. I dont understand why you needed to switch the drill bit and the work piece. Could you not just align the workpiece by placing it in the chuck, then transfer grip to the vice. You would then have the workpeice lined up, and can use the drill normally? Now i have re-read and thought about it, the advantage as I understand it is that, due to the workpiece rotating, the center point of the workpiece is automatically "seeked" for by the drill bit. the middle of the workpeice is the center of rotation, not the center of the drill bit, which may not be perfectly aligned. Nice! Hi Vik - I'd love to use notes from this post and a couple of your pictures in a book I'm writing - see www.makingthingsmove.com - and give you credit of course. Feel free to email me at dustyn(at)dustynrobots(dot)com. My deadline is VERY soon, so the sooner you get this the better! Thanks! I tried this myself, and for ages I couldn't get it to work, then I realized that the drill was turning the wrong direction. So I came back to your post and realized that you do say "It helps with the drill being in 'forward'" Is this what you mean, that you have to have it turn the opposite direction to which you would have it for normal drilling? Excellent idea. Thank you for posting. I can really use this. Beautiful solution! Thank you very much, this method will give me the best accuracy attainable with my drill press. It's a wonderful and really nice post,.